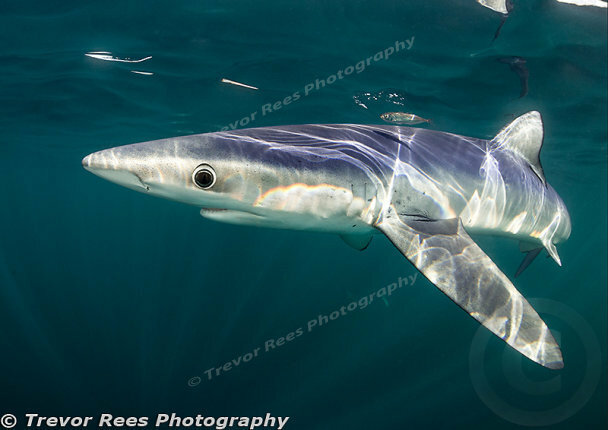 A blue shark (Prionance glauca), seen 10 miles off shore from Penzance in Cornwall. This attractive species with its slender shape and long pectoral fins is often a striking blue colour on the top of its body, hence the name. With this 5 foot long female the colour is not so obvious. Blue sharks live happily in our cooler British waters but are also found in most of the worlds oceans. Sadly, they are now a threatened species. This one was photographed at close range whilst snorkelling.